Welcome to my website, and thank you for visiting. Under the tutelage of my father, a master carpenter and cabinet maker, I learned the trades growing up in New York City. After a career in computer programming, and one too many layoffs, I've returned to my roots. No longer an avocation, this work is now my full-time career. 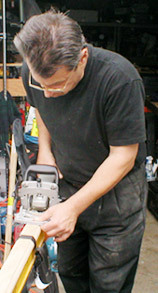 I provide a range of handyman and finish carpentry services requiring a high level of skill and attention to detail. My business is small jobs. I work by myself or with a helper. I hold a Massachusetts Home Improvement Contractor license, and am fully insured. I am a 20 year resident of Brookline, and live in the Village with my wife and sons (one in high school, the other in college).